Clearly, the awe-inspiring guitar guru, soulful singer and hit songwriter is not cruising in the fast lane, or racing in reckless fashion to snag fame's temporal brass ring. Instead, the album's eleven introspective and provocative compositions reveal a soul-searching journey colored by loss and gain, pain and joy. It is a journey that digs deep inside, reaches out to fellow travelers with selfless generosity, and arrives at a blessed state of grace. The entry point to this heart-baring aural canvas is the melodically engaging title track with lifelong friend and fan Emmylou Harris who contributed the haunting harmonies. "We chose that song as the title for the album because it seemed to encompass everything that we were doing with this group of songs" says Flowers. "Everyone has their own particular tool box of what they need to make their way in this life." As he notes in the opening verse, "The river of life is rough as it can be, boys. There's unknown peril waiting to unfold. But there's help for you today, if you feel you've lost your way. These are the tools for the soul." Flowers' life began atop a repository of death. He grew up the only child of a mortician, living in a small apartment above the Flowers Funeral Home in tiny Henderson, North Carolina. "You can feel pretty insignificant," says Flowers. Spending hours alone he was drawn to music. "I would sit and just absorb music. Having been raised at death's door he offers comfort in the wistfully healing track "Ready to Cross Over." "John Cowan and I wrote this for the funeral of a family member. Since then we've played it at quite a few other funerals. It's amazing how your family grows in time of need." "For the most part, when I write, the guitar is integral to the words, it's about 50-50, voice and guitar, they go hand in hand in the creative process. I don't know where a song will go until I am writing it. It almost always starts with the guitar; a melody unfolds, and I let the title find me, then it becomes a matter of using the tools I have found along the way." It's the guitar that also led the way to Nashville when his friend Gove Scrivenor invited him to play on his record. And it was in Music City that Danny found his musical mates. "I was in awe, playing with people who I knew from seeing their names." At that time in Nashville, Flowers remembers, there were all these snazzy record label guys, and then there was Cowboy Jack Clement and his group of scruffy on-the-edge outlaws. "I was in the Cowboy Jack group. I decided to stay in Nashville, and luckily got a job with Dobie Gray when "Drift Away" was a big hit and went on the road with him." He spent two years in that gig, honing his skills as a guitarist, and "absorbing my teachers, Muddy Waters, Robert Johnson, and all the great Delta bluesmen, along with the whole Chicago thing." Now respected by his peers as musician and revered in the trades, Danny's slide guitar more than weeps on his soulful homage to his blues muse "I wrote "Born to Believe in You" with my dear friend Gary Nicholson. This is my prayer of thanks to Robert Johnson for teaching me how to reach deep inside my soul & search for truth with the slide guitar as a tool." After R&B singer Dobie Gray, Flowers segued to country artist Don Williams. Flowers spent 13 years on the road with Williams. "My job was to take the Stratocaster and make it sound like all the different things that were on his albums." Besides learning how to bend a strat to his will Danny walked away from Williams with a lifelong ticket to ride, thanks to a blizzard in the winter of '78. "We were on the road in Tulsa and got snowbound. I borrowed one of Don's guitars, got some hotel stationary and wrote "Tulsa Time" in 30 minutes. A couple months later we were opening for Eric Clapton in Nashville. After the show Don, Eric and I went back to the hotel to hang out. We played "Tulsa Time." Eric who by then had became a good friend said, 'I love it, I want to cut it.' Don told Clapton he was going to cut it, but eventually, they both decided to do it. Obviously their individual versions were unique." In 1986, Flowers left Williams, and with the other members of Williams' back-up band -Biff Watson, Dave Pomeroy, Pat McInerney - recorded an album for MCA- The Scratch Band Featuring Danny Flowers. "It failed miserably," Flowers boasts. From there Danny continued his work as a sought after session player and sideman. 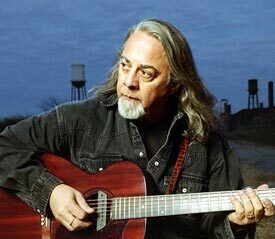 He put together the Blue Moon Orchestra for Nanci Griffith and honed his songwriting garnering cuts for the likes of Emmylou Harris and others. He found his own performance home at Nashville's legendary singer-songwriter venue The Bluebird Cafe'. It was during that time 15 years ago, at the insistence of his third and final wife, that he became un-medicated. "Jill said, 'enough', so I just listened to my best friend. It always felt wrong. It was like I was trying to take a shortcut to God." Flowers is not afraid to share that journey in "At The Open Door," his emotionally raw and honest song about taking those first steps to a new life. While honesty and pain may be a common thread, Flowers confesses that Tools for the Soul, with James Pennebaker as producer, began with no vision and no plan. "I just did it because I couldn't not do it. It was necessary. Each song on this record is like a piece of the whole thing, like fingers on a glove. There is an underlying element of redemption, salvation, and spirituality. It's what I have and I'm not afraid to say it. A lot of people who do spiritual music are driven by a need to teach. I don't have anything to teach. I'm just sharing, and the listener can take from my experience what they want or need. It's up to them." Flowers does have a vision of performance for Tools for the Soul. "I believe I can go out and represent this record by myself. I'm ready for it, ready for the challenge. This will be the first time to go out there as just me, not playing behind someone. It matters in a different way." The titles of the songs between the first cut and the last hint at what matters to Flowers these days: "Keep On Livin'," "Reason To Try," "What Would The Father Say," and "Ready To Cross Over." Though he collaborated on several of the songs, he flew solo on the final track, "I Was a Burden." "I thought about Curtis Mayfield when I wrote that song. I was nervous the first time I sang it, I wondered if I wanted to reveal that much of myself. But, I think it works." It not only works, "I Was a Burden" soars with honesty, a resounding and triumphant anthem of confession, acceptance, and enduring faith. I was a burden 'til the Lord laid his hands on me. Heal yourself; it's what you should do. Forgive yourself, the way I forgive you. when you're standing in the light. The son of a mortician who was told for 18 years to be quiet is now more than ready to be heard.